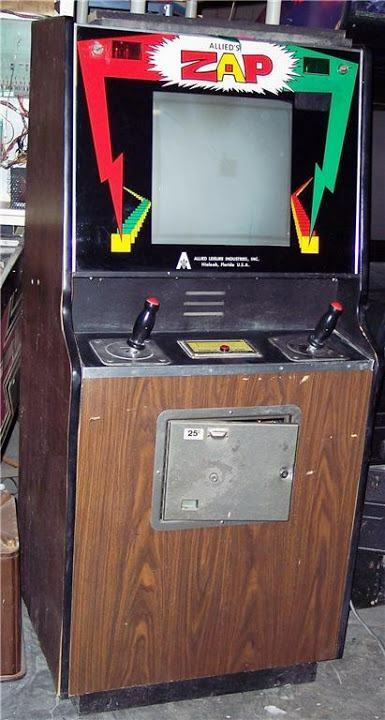 An old collecting buddy forwarded me a sale post for an Allied Leisure Hesitation arcade video game cab from 1974. 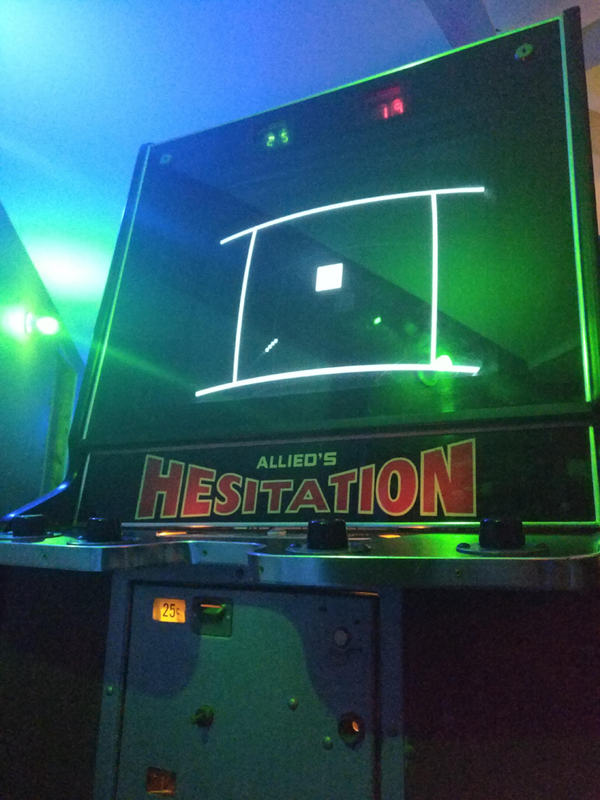 To be honest, I had never heard of nor seen Hesitation before. But, the picture sold me. 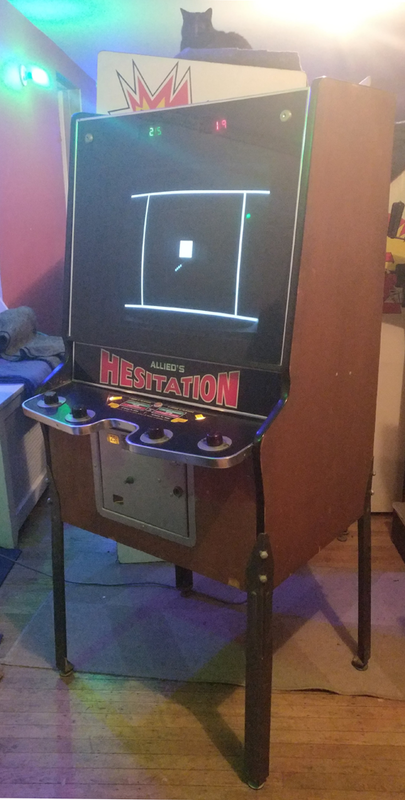 Check out its Numitron scoring and unique cabinet design. Years ago I tried to track down Allied’s Zap, another game with Numitron scoring, and came up empty. I was stoked to see this turn up only an hour and a half away from home. These things don’t have feet, you know. Made an offer on the game, but the seller was fielding offers from others. A week later he called and accepted. The seller told me that his brother had saved it in the early 80s after a Philly bar tossed the cabinet out on the curb. The two brothers held the game for the next 35 years or so, until I brought it back to Philadelphia. Universal Research Laboratories in Elk Grove, IL had developed almost all of Allied’s prior circuit boards, and followed suit with Hesitation. Like most other pong video games, it’s a TTL1 game with no ROMs. In 1974 “ball and paddle” sales screeched to a halt as the Pong2 fueled bubble of the year prior had burst. Most pong games from ’74 are hard to come by, and Hesitation is no exception. The cabinet has a serial no. stamped in the cabinet of 118. There couldn’t have been many more than 200 made. This Hesitation could possibly be the very last one in existence. 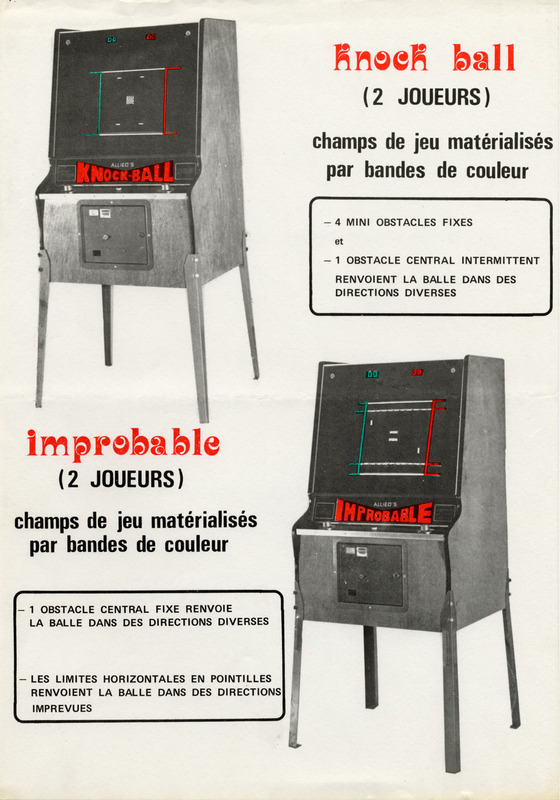 Allied also released a few other “ball and paddle” games with a similar cabinet form factor mounted on pinball legs. including Ric-o-chet, Knock Ball and Improbable. I’ve never seen a Knock Ball or Improbable outside of the flyer. Please forward me a pic, if you’ve come across one. Later on in 1975, Allied made their final ball and paddle games: Futsbol and Robot. 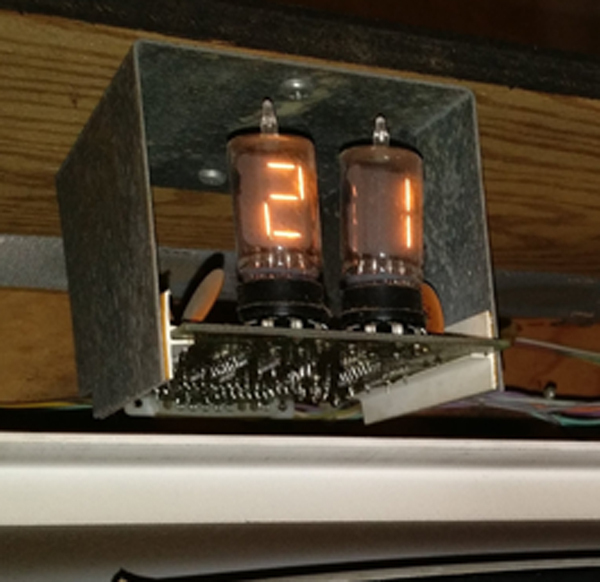 Numitron vacuum tubes are sort of like Nixie’s poor sister. They utilize a seven segment display which makes them clearer to read. The tubes only require 5 volts making them ideal for use in an arcade cabinet. Very few bronze age arcade games use external displays for scoring. As a collector, it’s a real treat to see something like them in action. Game play is a ball and paddle game with either 2 or 4 players. There are paddles on left and right for two player games. When playing four player, two additional paddles are placed top and bottom, and players are divided into teams of two: top and bottom vs left and right. There is an optional square block in the middle of the screen which can be turned off via a switch on the circuit board. One thing about this pong variant is that the ball “hesitates” after a scoring rebound. The length of hesitation is also adjustable. I haven’t had time to gather four friends to take a proper video, so here’s a quick lil demo. Per request, I added some additional pics of the Allied Hesitation PCB, control panel and monitor. I had to open up the underside to clean the paddle pots. Control Panel underside.